Welcome to the Yamaha YZF- R3 showroom and spec review. The all new 2015 YZF-R3 is now for sale in Australia and marks the first genuine competitor to the traditional learner and entry level ‘sports’ styled motorcycles Honda CBR and Kawasaki Ninja series. The YZF-R3 looks good in real life and different to it’s main competitors so should be applauded. Furthermore true to its sporty intentions the Yamaha offers for the YZF-R3, performance accessories in terms of Akrapovic slip ons and racing fill exhaust system. The racing system cuts nearly 5kg off the weight and adds power and torque while the slip on exhausts cuts up to 2kg off the kerb weight. Prices quoted where $400 – $850 for the various systems which is quite resonable for genuine performance increases. 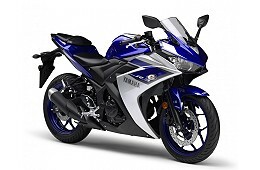 Overall the YZF-R3 and another good model to look at in your search for a new commuter or learner motorcycle.